Definition: Formal and informal linkages aligning key stakeholders (e.g., service providers, sectors, donors, priority disease programs) to maximize use of resources for HRH. Mechanisms and processes for multi-stakeholder cooperation (inter-ministerial committees, health worker advisory groups, observatories, donor coordination groups). Community involvement in care, treatment and governance of health services. Mechanisms in place to involve communities in health services. Partnership Building: Practical Tools to Help You Create, Strengthen, Assess and Manage Your Partnership or Alliance More Productively. Capacity Project, 2007. Managing Partnerships. World Health Organization, 2008. Mobilizing Local Resources to Support Health Programs. The Manager, Management Sciences for Health (MSH), 2002. Strengthening Health Professional Associations. The Capacity Project, 2007. 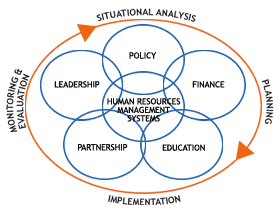 Using Collaborative Approaches to Reach Human Resources for Health (HRH) Goals. Capacity Project, 2006.